The Mason Jar was invented in 1858 by John Landis, a Philadelphia tinsmith responsible today for billions of well-preserved canned fruit and re-gifted dry soup mixes. When Mr. Landis invented the jar and sealing lid, he may not have envisioned using the sturdy jar as a precursor for a handy mug. 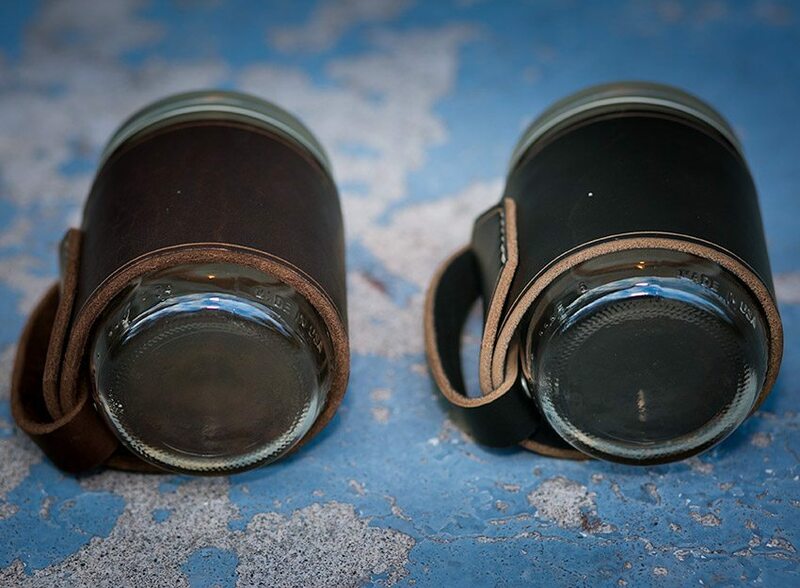 Kyle Koster of Range Leather, however, did have this vision: he created the Range Leather Range Mug. 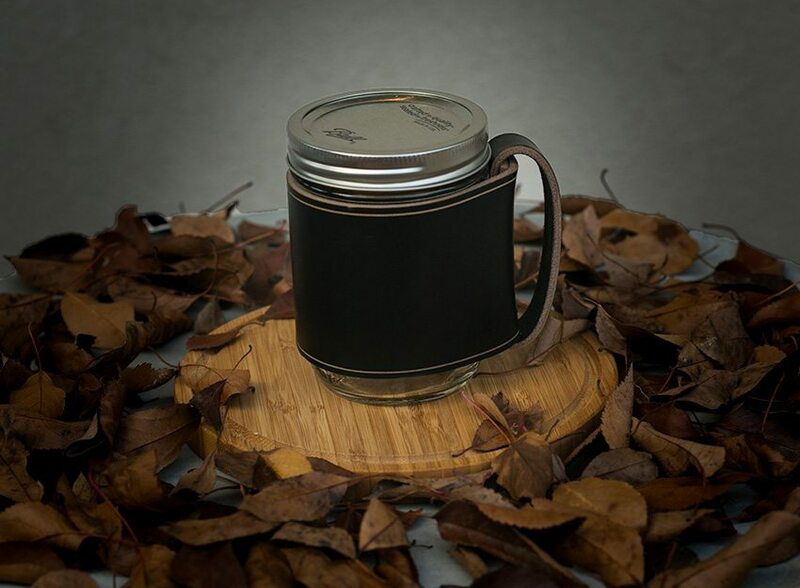 As a combination of high quality, 10-ounce Horween leather thoughtfully put together with a wide-mouth, pint Mason jar, the mug is a unique addition to the wide world of uses encompassed by the home canning jar. Kyle started Range Leather after customers who favored his Hogjim nylon guitar straps and locking mechanism asked for a guitar strap made of leather. He began taking lessons from an old cowboy at Tandy Leather in Spokane, Washington, and from that, making the guitar straps became a reality. However, the straps and locks were such a success that he decided to license the design out to a large company who can ensure wide distribution in time for the holiday season. Since Kyle had the skills to work the leather, but no product to produce due to the licensing agreement, he started coming up with other product ideas of everything from wallets to pipe cases. It was still up to him, however, to find a reliable source of leather for his small but growing company. 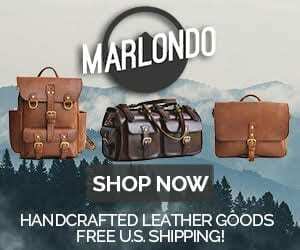 Having grown up in Chicago where Horween Leather is located, he visited their facilities and fell in love with their leather, as well as their desire to work with small companies. He managed to procure a large amount of high quality leather from Horween and has never looked back since then. 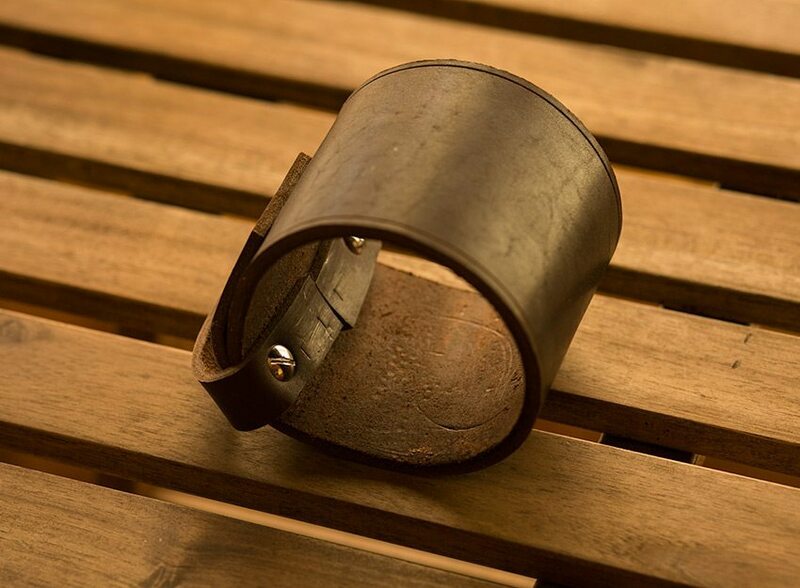 Today, he only uses Horween Leather in his products, and the Range Mug is no exception. You can learn a bit more about Kyle’s story and inspiration in our audio interview series, found here. The mug is constructed of a 10-ounce leather sourced from the Chicago-based Horween Leather. The leather handle is secured to the sleeve with two Chicago screws. The sleeve is finished by hand sewing to fit the wide mouth Mason jar. Chicago screws are a type of fastener with a barrel-shaped flange and a protruding boss with an internal thread. This type of screw ensures the leather fits snug against the jar and won’t ever stretch out of shape. The overall weight of the jar and sleeve is 14.6 ounces, which probably doesn’t make it amenable to the weight-concerned hiker. In this case, you’re going to be trading weight considerations for function and aesthetics. I found it to be a trade in my favor, as I’m not much of a back country hiker. 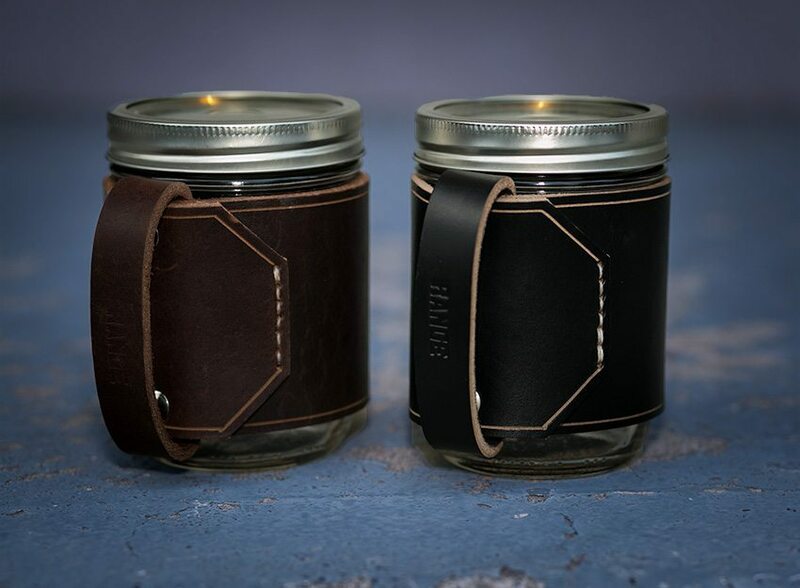 The heavy duty leather sleeve is designed to fit around a 16-ounce wide mouth Mason jar. Both sleeves I tested fit snugly around the jars. As a test, I filled the jars with water and sealed the lids on tight. Holding the jars upside down and shaking them, I noticed no leaks, and the sleeves stayed in place despite my best efforts. While conducting my test, I found I like the way the mug fits in my hand. I have large hands, and was able to put three fingers through the handle, with my thumb opposite, giving a solid grip that would prevent me from dropping the mug. I was also able to hold it by putting four fingers through the handle with my thumb on top in a more traditional “coffee-drinking” style. For cold days with hot beverages, I’d recommend the first method of holding. For warmer days with cold beverages, I would choose the second, unless you prefer to have cold hands. The third style of holding this mug, for the true pros, is to use the two-handed wrap around method to give both of your hands an opportunity to stay warm or cool, depending upon your beverage. One concern I had with the sleeves is that they would loosen over time due to the natural tendency for leather to stretch. When I interviewed Kyle, we discussed this concern, and he noted that after six months of use, he hadn’t seen this become an issue with his test sleeves. Minimizing the possibility of stretching is also the reason he used a heavier leather in the construction. The overhanging lip on the upper portion of the Mason jar also prevents the sleeve from slipping upward. The raised lettering found over the outer surface of the jar adds to the friction between the jar and the sleeve. 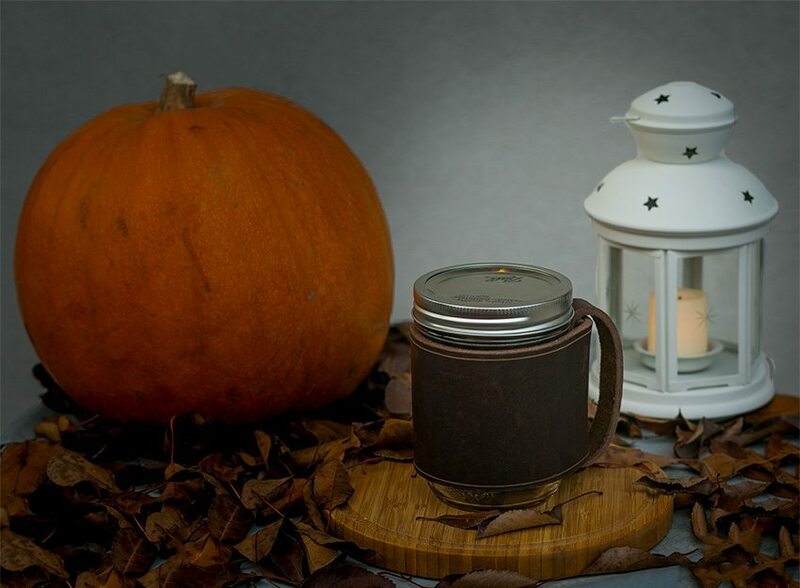 My favorite feature of the Range Mug is that the thickness of the leather and its tendency to act as an insulator means the mugs make a fantastic hand warmer with hot beverages. Even if the liquid in the mug is too hot to drink, it will radiate heat throughout the leather sleeve that is pleasant to the touch, like holding your hands over a warm car heater. It is also important to note that as with all leather, you’ll want to remove the sleeve prior to washing the jar. Leather doesn’t do well when it gets exposed to liquids over long periods of time. Should the sleeve get damp, simply wipe it clean with a dry paper towel. 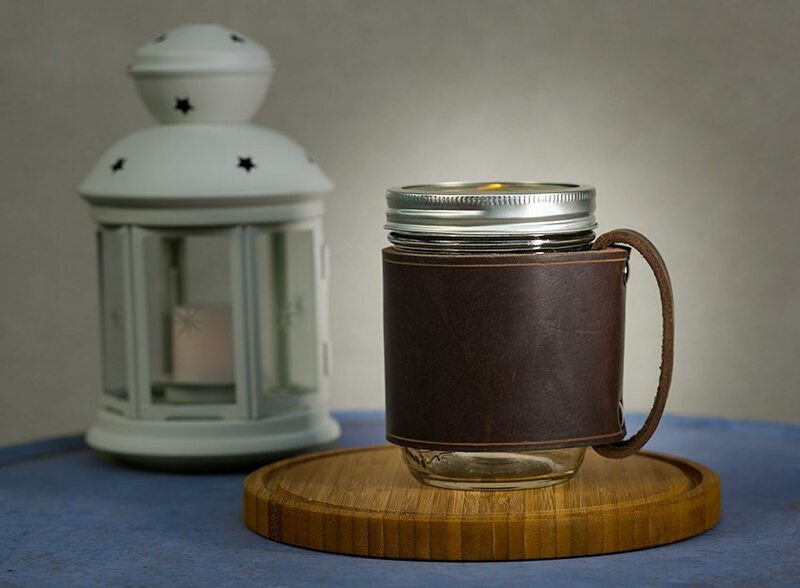 The Range Mug bring an aesthetic element to the Mason jar that elevates it far above the simple drinking vessel used for summertime iced tea and college parties. I can envision them in coffee shops, restaurants, and homes where you want something more than just the traditional coffee cup. The colors available to us were brown and black, traditional colors that go well with pretty much any décor. The stitching is a minimal contrast stitching that goes well with the embossed border surrounding the sleeve. We recently had a group of friends over for a birthday party who hadn’t seen the mug before, and all of the comments were that they liked the simple, sturdy design in the way it looked and felt. If you can’t trust the opinion of the majority, who can you trust? By the success of the Kickstarter campaign Kyle ran for the Range Mug, it is already a success. With an initial goal of $2,000 (which he met in four days), he was able to raise over $8,000 to fund the initial materials purchase and manufacturing of the mugs. At the price point of $30 per mug, it’s a good value for what you’re getting. Anytime a craftsman uses leather this heavy in a product, it adds significantly to the materials cost. While Kyle could have used a lighter leather in the construction, I’m glad he didn’t. The thickness provides great insulation, is resistant to stretching, and looks good. The biggest issue you’re going to have with the Range Mug is on deciding how many to purchase. While we can’t help you with that decision, we can tell you that the mug is solid and good looking, and will elicit comments from admirers whether you have these in your household or place of business.